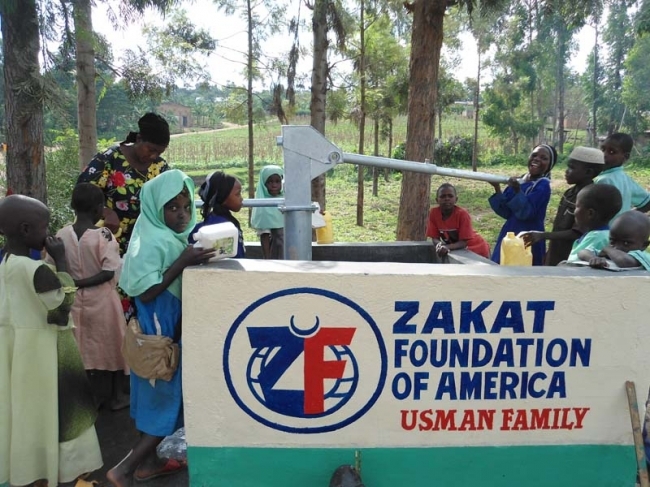 Zakat Foundation of America (ZF) has just begun the building process for a well in Lwakhakha, a small market center in eastern Uganda bordering Kenya. Lwakhakha has approximately 3,000 people, the majority of whom are Bamasaba, a community that has embraced Islam as their religion because of similarities between their culture and Islam. The Bamasaba community is made up of peasant farmers. The Bamasaba eat from what they farm and their shelters are comprised of huts made out of banana leaves or grass for roofs, while the walls are made of clay and stick. The few who are fortunate have clay houses with metal roofs. Women and girls in the Bamasaba community are responsible for domestic chores, while men take care of the farms and livestock. River Lwakhakha is the main source of water for this community and it posses many challenges. The women and girls use clay pots to fetch water from the river. As per their traditions, the Bamasaba do not boil drinking water, instead they store the water in clay pots in their huts.They wait for the water to decant, or for impurities to settle, before they drink it. River Lwakhakha is very powerful and many who try to cross it do not succeed. Animals, like donkeys, which are used for crossing over into Kenya, end up drowning in the river. The force of River Lwakhakha has also swept away people trying to make it across. As a result, human corpses are often found floating in the river banks. This has intensified the danger of the spread of cholera in the area. The community members also use the river for bathing, for cleansing rituals, and as a drinking source for their livestock. The water is severly contaminated and until now, the people had no choice but to use the water from the river. This is why ZF has come in to provide reliable, safe drinking water to the community. ZF representatives note that the community has been extremely excited since the ZF team first touched down in the area. The people have never seen an NGO in their community and the only humanitarian work they have heard of has been from what they have heard over the radio. The Bamasaba people are happy that they have not been forgotten and thank ZF for choosing their community as the site for a new well. Making a lasting difference in the world and donate to the One Year, 100 Wells campaign today. My family and I are wondering how much it would cost to build a well like this one on behalf of my father, who recently passed away.